Have you ever run an online auction fundraiser and the bids come in s-l-o-w-l-y one by one? Although small increments for online auctions can provide engagement and activity it may not produce the maximum potential for the highest bids. In a standard online auction after each bid is placed the outbid bidder does receive a notification but then NEEDS to do something to then be back on top. We at Auctria we have resolved the answer, its Proxy Bidding. We didn’t invent proxy bidding but we did perfect if for online auction fundraising. 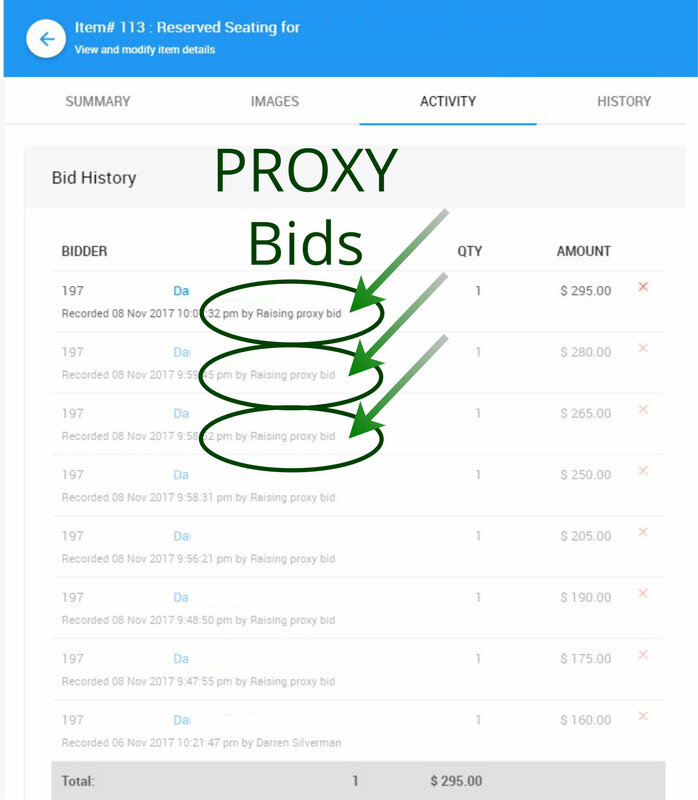 A more descriptive term for proxy bidding is automatic bidding. Proxy bidding accelerates the bidding so more bids go higher, faster. The greater the number of bids, the higher the auction fundraiser proceeds. Proxy Amount: this is the maximum you are willing to bid on an auction item, this information remains confidential Proxy Bid: In accordance with the bid increments, small bids are placed on your behalf up to the maximum proxy amount specified Proxy Bidder: a bid that is automatically placed by the on behalf of a bidder when outbid by a previous bidder Notifications: Notifications are triggered if the maximum proxy amount has been exceeded by another bidder or if the auction ends and you have the winning bid. Proxy bidding allows bidders to set a the highest price they are willing to pay for an auction item without having to “baby-sit” their bidding. When offering proxy bidding auction fundraising administrators have found that auction items do go for higher prices. Why would a bidder use a proxy bid? You find an auction item you truly want to win. The bidding starts and you have a pretty good idea that the bidding will escalate with time. In a traditional bidding scenario you wait to get outbid, then place the next highest bid and this goes round and round till times up. In a proxy bidding scenario the bidder can place a private proxy bid for the maximum you are willing to pay. The system will keep the actual bid as low as possible yet provide a path to remain the winner IF the bidding stays within the proxy amount. If the bids do go higher than the proxy amount the proxy bidder will need to re-bid or re-proxy to a higher bid. Proxy Bidder enters the highest price you're willing to pay for an item, and we do the rest. The Auctria system will then bid on your behalf – enough to keep the bidder in the lead, but only up to the maximum limit submitted. When you place a proxy bid you are reserving all the bid amounts upto (and including) the proxy amount. When someone else places a bid it will uncover your pre-existing bid and you remain the winner at that new level. If someone outbids you, we'll let you know so you can decide if you want to increase your maximum limit. 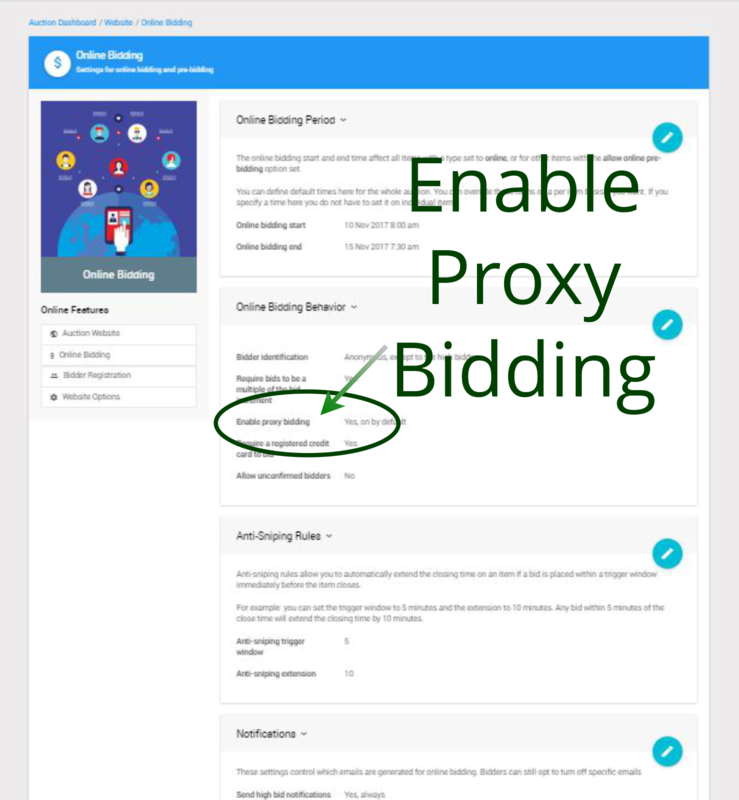 Proxy Bidding is a feature available for Online Auction Items only and allows the system to manage a bidder's bid to ensure that they remain as the high bidder for as long as possible. It provides a bidding mechanism to keep their actual bid as low as possible yet provide a path to remain the winner. With proxy bidding, if you are the highest bidder, then upon the auction's close, you become the winner. 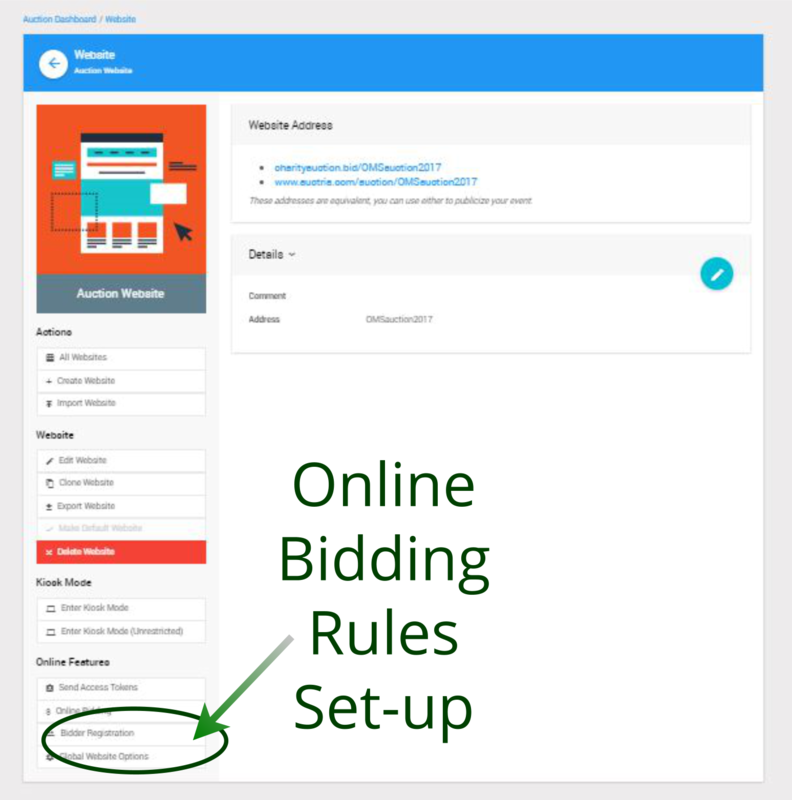 As the winner, with proxy bidding, you will only pay the lowest possible winning bid, which may not actually be the maximum amount you bid for an item. 'Yes, on by default' then proxy bidding is available for online items and checked by default. 'Yes, off by default' then proxy bidding is available for online items but not checked by default.